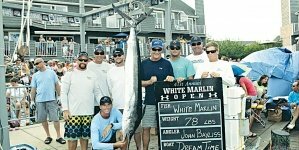 Get your rods, reels and tackles ready — The White Marlin Open returns for its 45th year August 6 – 10, with purse money expected to exceed $5 million. 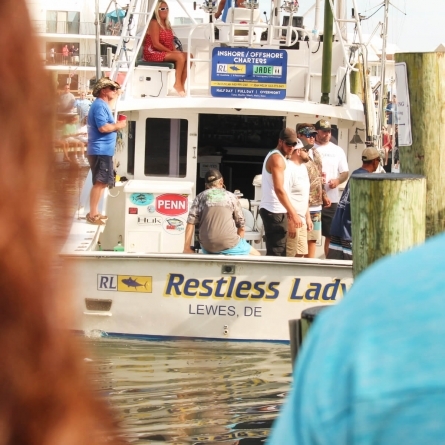 The white marlin has all but been crowned the official fish of Ocean City, and every year the billfish and its annual tournament draws thousands of anglers and onlookers to the water and the weigh-ins at Harbour Island on 14th Street and the Bay. 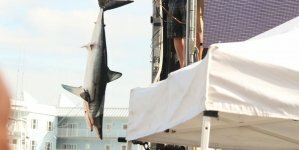 In addition to white marlin, prizes are also awarded for sharks (pictured here), blue marlin, wahoo, dolphin and tuna. The largest billfish tournament in the world. Not only is the White Marlin Open the largest billfish tournament in the world, it’s also held in the “White Marlin Capital of the World.” It was President Franklin Roosevelt who first awarded Ocean City that title after a prosperous day spent fishing at the Inlet in 1939, and the town has more than lived up to its designation in the decades since. 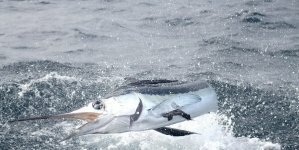 The first White Marlin Open was held in 1974 and continuously awards prize money to white marlin, blue marlin, tuna, wahoo, dolphin and shark catches. The first tournament awarded a total of $20,000 in prize money, with a top prize of $5,000; in 2017, more than $5 million was awarded in total, with a top prize of $1.6 million. 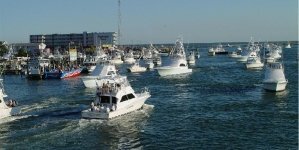 The tournament was already a decent size in its first year, with 57 boats and 150 anglers competing for 20 grand, but since the 70s the White Marlin Open has absolutely exploded. In 2017 there were 358 registered boats and over 3,000 anglers. In 2018, it’s expected that the total payout will exceed $5 million. And still, the tournament’s founder Jim Motsko remembers a time when the White Marlin Open was only a dream. I was on my honeymoon and I told my wife, wouldn’t it be nice to earn a living doing the job you really love to do? And to make a living out of it? Motsko worked his way through school at the University of Maryland by working on charter boats in Ocean City every summer. That’s where he learned how to reel in a white marlin, and eventually the White Marlin Open materialized. He himself fished in the first 34 tournaments — “I wanted to win the money so I could take it and go fishing with it, because it’s not a cheap sport or hobby,” he said — but nowadays he does most of his fishing after the tournament is over. The white marlin’s upper jaw, also known as its bill, is twice the size of its lower jaw. White marlins use their bills to stun fast-moving prey, which include small fish like mackerel and flying fish. White marlin are known to put up a fight when hooked, leaping into the air and waving their tail around. They have an average lifespan of 25-30 years. While they inhabit waters deeper than 100 m, the white marlin swims closer to the surface. When swimming they’re known to show off a technique called “tailing,” where the dorsal lobe of their caudal fin can be seen peaking above the surface of the water. White marlin fishing season in Ocean City typically begins in mid to late June. The earliest documented catch was May 25, and the latest documented catch was June 20. The season is over by early September. 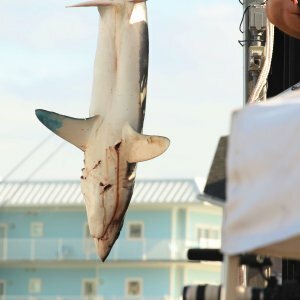 The Town of Ocean City awards a $5,000 prize to the fisherman who makes the first catch of the year, while the Ocean City Marlin Club and Fishermen United for Ocean City each award $5,000 prizes of their own. That’s how the crew of the Stalker took home around $15,000 this year for making the first catch of 2018. The largest white marlin catch of the WMO was a 99-pounder caught by Steve Bass in 1980. The largest white marlin ever caught on record was 181 pounds, caught off the coast of Brazil in 1979. The state record for Maryland is 135 pounds. There are no age restrictions when it comes to competing in the White Marlin Open. 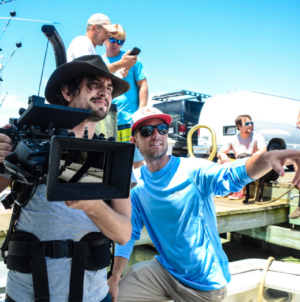 Whether the angler is seasoned or novice, Motsko said, isn’t of much importance, although someone who’s able to catch more white marlin in general will obviously have a bigger chance catching a larger fish. But still: 2017’s top winner took home $1.6 million for his first-ever white marlin catch. 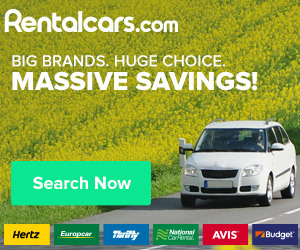 Teenagers have taken home top prizes in the tournaments. Like its name says, the WMO is truly open, and full of possibilities, for any angler — regardless of age or skill level. Here are a few of the WMO founder’s white marlin fishing tips. White marlin are not fish that can be hooked by the passive fisherman. The angler can’t sit back on the boat and doze off while waiting for a bite. “In order to be successful, you gotta pay attention to what’s going on,” Motsko said. “The secret is to get to the fishing rod and get a hold of it before the marlin bites the bait.” You have to let him eat it more or less, Motsko said, for a 5 or 10 count, letting the line freespool once the fish bites so it doesn’t feel any tension. Then after that 5 to 10 seconds, put it back into gear.